The third annual SC Econ Day brought more than 100 state finalists from 10 high schools around South Carolina to the Darla Moore School of Business to put their economics knowledge to the test. 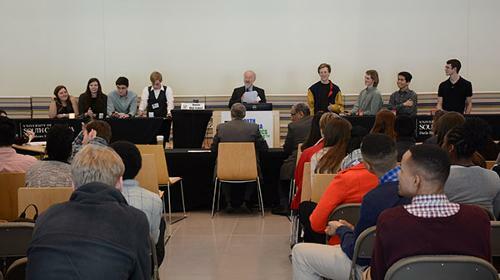 The students were split into 23 teams that all competed in one of two divisions — the David Ricardo division or the Adam Smith division. In the final two Jeopardy-style quiz rounds, River Bluff High School's team "Guns and Butter" and Wando High School's team "Big Macks" won first place in their respective divisions. 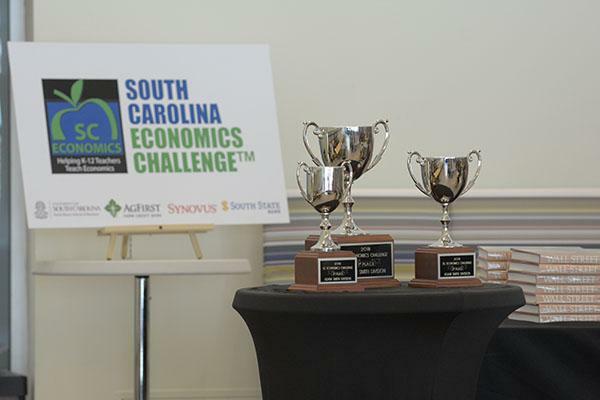 In addition to taking home prize money, the competition winners are eligible to advance to the national semi-finals where they would compete for the opportunity to go on to the National Economics Challenge in May. 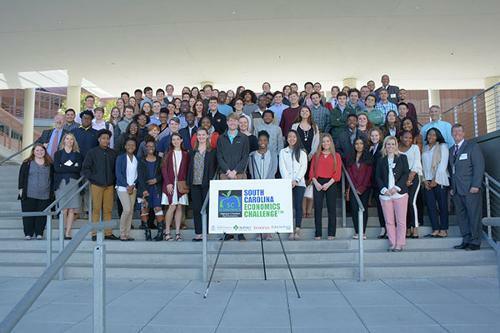 Not only would semi-final winners get funding toward their trip to New York City for the final competition, but they would also be competing for more than $20,000 in prizes against thousands of high school students from across the country. SC Econ Day is put on by the nonprofit SC Economics with the help of the Darla Moore School of Business. This competition is just one of the many ways that SC Economics strives to improve economics education at the grade school level. This year, among the guest speakers from the business community and Moore School professors, SC Economics invited Dean Peter Brews to speak. "We were so excited that he was able to speak, and the students really seemed to be engaged in what he had to say," said Rhonda Fulmer, director of education initiatives for SC Economics. Between the competition portions, the high school students got to hear from current Moore School economics students and professors about what they do and why they choose to pursue economics. 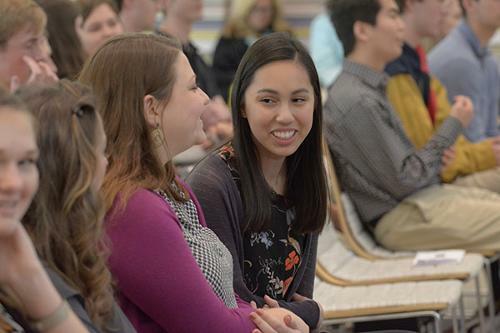 Students had the opportunity to attend three different sessions to learn about topics such as the economics of climate change and experimental economics. "I went to the economics of climate change breakout session," said one of the Adam Smith division participants. "It was interesting and exposed me to a very different side of economics." 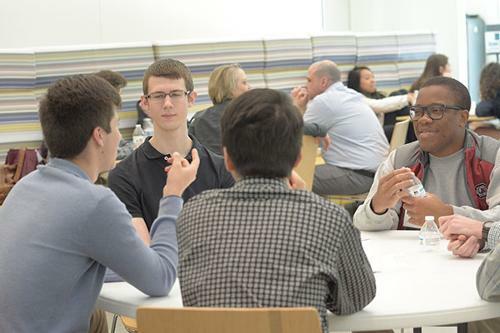 Many students agreed that their sessions were interesting and engaging and thought SC Econ Day as a whole was a great way to quickly gain exposure to what majoring in economics looks like. 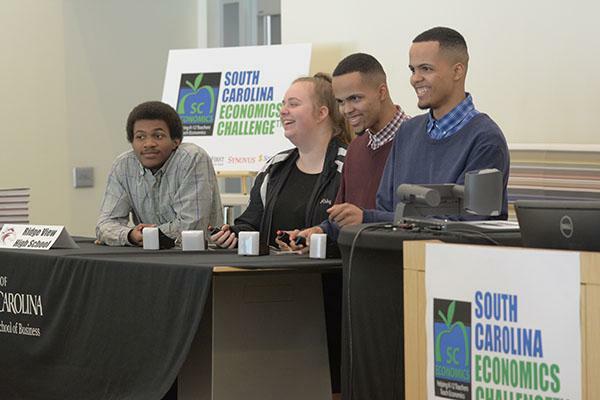 The third annual SC Econ Day brought more than 100 state finalists from 10 high schools around South Carolina to the Darla Moore School of Business to put their economics knowledge to the test.